One of the things we'll be seeing plenty of at this year's CES is streaming media boxes. Last year, Apple and Google made big splashes in the field and Roku and WD Live are both maturing nicely into must have TV accessories. And now Iomega has entered the fray with its new Iomega TV. 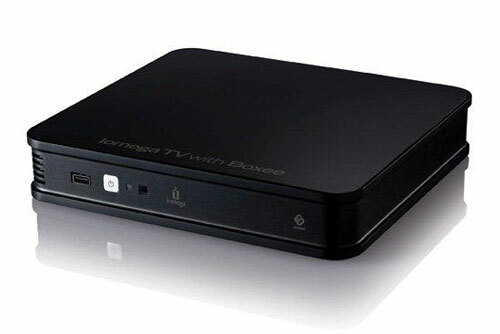 Surprisingly, Iomega skipped on Google TV and went with the start up Boxee to provide the software for its TV-streamer. Boxee made a big splash at last year's CES but struggled to get its quirky Boxee Box—manufactured by D-Link—out the door until just recently. The Iomega TV is, in essence, a Boxee Box with a more conservative design that will blend in nicely with any home theater set up. 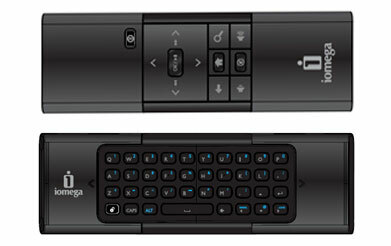 The Iomega TV even comes with a QWERTY remote like the one packed with the Boxee Box, which makes both web browsing and searching for shows much easier. And, like the Boxee Box, the Iomega TV will play full 1080p video. The expected bevy of hookups can be found around back, including USB ports for plugging in external hard drives, Ethernet for getting online and the all important HDMI for hooking up your TV. And if you're not one for stringing wires around your house, you can connect to the Internet using the built-in Wi-Fi. The intro level Iomega TV will sell for $229.99 (starting at J&R sometime in the next couple of months), about $30 more than the Boxee Box. Though the Iomega TV comes with an HDMI cable, which makes up for some of the difference. At the same time, you'll also be able to get your hands on two premium models that add a hard drive to the mix. A 1TB model will run $299.99 and a 2TB model $349.99. This means that, in addition to the tons of great streaming content available through Boxee, you'll be able to play back locally stored videos (in almost any file format you can imagine). Connect the Iomega TV to your home network and your other computers will see it as a networked hard drive that you can easily copy movies and TV to. While you could easily do the same with a Boxee Box by plugging a USB hard drive into it, the Iomega TV saves you the hassle and the bulk of having two separate devices. The Iomega TV boxes with built-in storage also feature Iomega's Personal Cloud, which allows you to access your files from any remote location with an Internet connected PC, Mac or smartphone. Save vacation pictures to your home storage while still on vacation, pull up photos of the kids from home when at your in-laws or just get some work done while on the road. Size-wise, the Iomega TV without storage is 8.8” x 6.25” x 1.73" and with storage is 8.8” x 9.69” x 1.73”. The Boxee software still has some serious maturing to do (I'm not sure if I'd call it "consumer friendly" just yet), but by partnering with Iomega the company is showing that it's serious about playing with the big boys in the streaming media market and ready to take on the likes of Google TV.